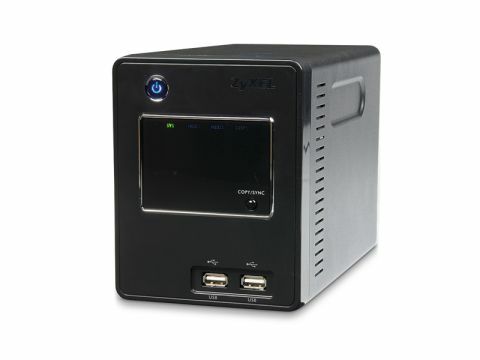 An update on the NSA-220, the 'Plus' edition of this NAS box (Network Attached Storage) offers the option of greater capacity (up to 3TB) and is DLNA 1.5-certified for compatibility with a vast array of modern media devices. It doesn't come with hard drives (it's just a shell) so you'll have to add one or two yourself (it can take two drives of up to 1.5TB each). The box sits on your home network via Ethernet cabling and also has two USB 2.0 connections for hook-up with further external hard drive/memory sticks – files on which can be automatically copied across at the press of a button. Other features include an auto-upload mode for photos and video to Flickr and YouTube, a BitTorrent client and software to perform complete back-ups of your system. Access to the 220Plus is via HTML (webpage) and is nicely spaced out and easy to navigate, as long as you're fairly computer literate. While basic, the BitTorrent client does a good job and maintains a decent speed of download. It also places files in easily identifiable folders, which can then be transferred to other shares (folders). It's a doddle to set up, from fitting the internal hard drives (into two bays) to creating shares and linking it with iTunes and other software. You will have to remember hard drives need to be acquired separately, adding a fair whack to the cost (depending on the capacity). Also, the GUI and auto back-up software is only PC-compatible – no Mac support here, folks.